Why are young people interested in computer science? 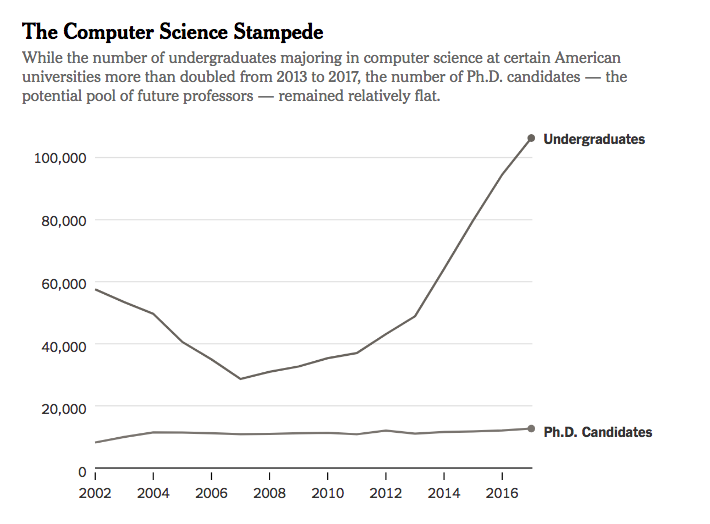 The New York Times shows this graph, which shows a dramatic decline in the number of students interested in computer science, followed by a dramatic uptick. I find it frustrating that the article focuses on the uptick, without making any comment on the decline. The article says that enrollment in CS majors has doubled since 2013, but it doesn’t mention that it was only in 2014 that enrollment got back to the level of 2002. That’s a 12 year lull, which would certainly justify why the universities might have avoided hiring more computer science professors. Why such a dramatic loss of interest in computer science? The article suggests that students now see it has a career with bright prospects, but some of that should have also been true back in 2002. It’s certainly true that the USA lost a lot of manufacturing jobs from 2000 to 2010, and that took out a lot of computer programming jobs, but in 2002 it was also clear that the Internet was going to be big thing. The situation was not hopeless. Although I suppose not quite as bright as today. The underlying economics have not swung as strongly as the student enrollment has, so I suppose there is an element of fashion to this. People (students and parents) were irrationally afraid of the future of computer programming in the USA in 2002, and they are irrationally hopeful about it now. Outsourcing things overseas was a problem, and remains a problem. The end result is that over 16 years, enrollment is up 40%, which is not a dramatic increase in 16 years. But the up and down swing is absolutely wild.